Today was one of those days when I tried to do a little more than my usual weekday work. I left work early and decided to do grocery shopping, so that I don’t have to spend time on it over the weekend. By the time I reached home carried everything to our apartment on 2nd floor, I was tired. Then I picked Ishaan from daycare and reached home totally exhausted. I wanted to make something simple, but then I found a plantain that was sitting in the refrigerator for a while. 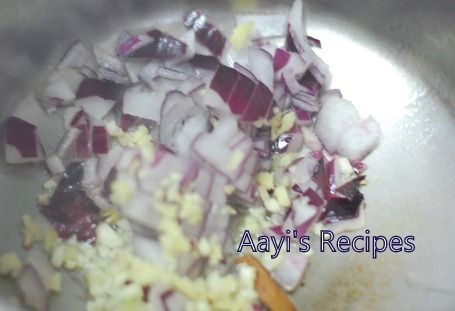 I thought of making alsande randayi, which is one of my favorite Konkani dishes, but didn’t have grated coconut. 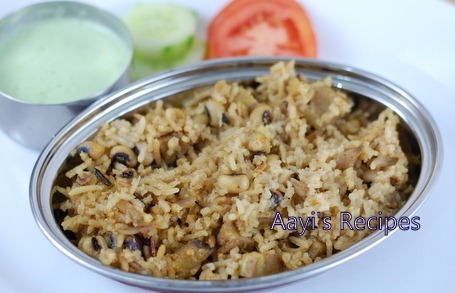 So I thought of making a simple pulav which would taste almost like the randayi. I had bought a pack of coconut milk powder a while ago which was sitting unopened in the pantry. So I used that. It took few minutes of prep time. While that was getting done, I thought a mint chutney would go well with it. So I made this chutney/tambli. It was a very tasty and filling dinner. Heat ghee/oil. Add cardamoms, cinnamon, ginger, garlic, onion. Fry for few minutes. 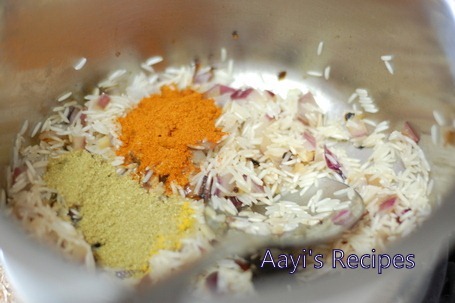 Then add rice and fry for few minutes. Add turmeric, chilli powder, coriander powder and fry for few minutes. 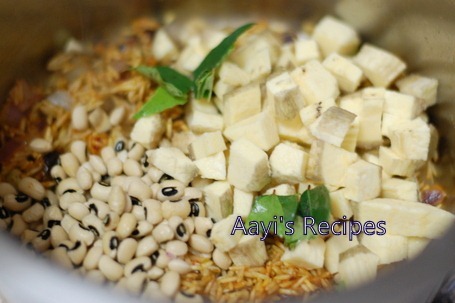 Add black eyed beans, plantains, salt, curry leaves. Mix well. Add coconut milk and 2 and 1/2 cups water. Let it cook till done. (I used a steel vessel to make the pulav. After the above steps, I transferred the vessel to rice cooker. I use my rice cooker like normal pressure cooker. Easy to clean up. I just add a cup of water to the rice cooker, and then keep the steel vessel with food in it. The rice comes out very well). Mint chutney : Grind together 5-6 strands of coriander leaves (along with the stems), 4-5 leaves of mint, 1 green chilli(optional) and 1 cup yogurt, salt to a smooth paste. How delicious! I can identify with the exhaustion but you certainly turned out a fabulous meal. That looks wholesome and you deserve a clap for making it at the end of a work day. First time here, you have so much of content, will come back again. Have you checked the sundried items that are already on the site? Nice recipe. I like the addition of the coconut milk to the rice. I love coconut milk but most of the tinned coconut milk available in the market have artificial preservatives in them. Is there a particular brand that you use? I used Maggi coconut milk powder. Nothing can be compared to freshly made coconut milk. I use this only when I want to make something quickly. Absolutely fantastic recipes. Unfortunately cannot understand some terms like ‘aslande’ (I am a gujju) but that’s okay. I am more interested in something else – who clicks these pics? You? Fabulous!! It is called Lobia I think. Yes, My husband & I take the pictures for my posts and aayi(my mom) & dad take pictures for mom’s posts. We tried this out yesterday and came out excellent. Who would’ve thought that such a tasty dish could be done with Kaaramani and Vazhakkai (Tamil for black eyed peas and raw banana)? We have been trying out recipes from your site for quite sometime now and it has become a household name for us. Thank you so much. Keep going. Mint Chutney gives it a special flavor and complements it. 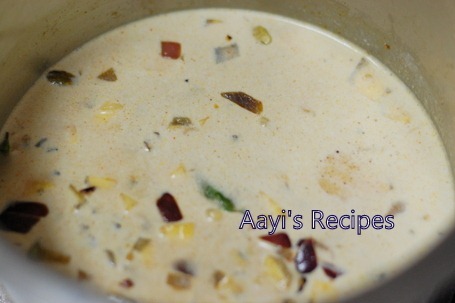 I have also tried pyaj tamatar raita with it. I tried this yesterday and my husband and kid loved it. I am a big fan of your site but posting a reply for the first time.